People who are interested in ships lying at the bottom of Lake Superior are excited about a recent discovery. A ship called the Benjamin Noble was lost with all 20 crewmen, back in 1914. It disappeared into the lake during an April storm, and it's been the target of a lot of unsuccessful searches over the years. But now a few people know exactly where it is. Duluth, Minn. — Randy Beebe is part of a four-man team that spends most of their spare time out on Lake Superior, looking for and photographing shipwrecks. The searchers were out on the lake last fall, looking for a different ship -- the Robert Wallace. "It was the last pass of the day, which was going to be the last day of the search season," Beebe remembers. "We were just going to pull up the side-scan sonar and head in, and we noticed a target on the screen. So right away we headed over there and investigated it more with the side-scan sonar, and sure enough we had a shipwreck." They expected to see the Robert Wallace, which was a wooden ship. But this ship was steel. "We were able to drop a camera into the hold of vessel, and see railroad rails, which was the cargo of the Benjamin Noble," says Beebe. "And that pretty much firmed it up in our minds that that was the vessel we had." The wreck is about 20 miles out from Duluth. At that point, the lake is about 400-feet deep. Another member of the team, Jerry Eliason, says it's one of the strangest wrecks he's ever seen. The front half of the ship is buried in 40 feet of mud. "I guess the fact that it was heavily overloaded, and carrying steel rails, is the reason," says Eliason. "I mean, it was just a submarine waiting to happen. We believe that a wave just boarded the ship, weighted it down and just sent it to bottom virtually instantaneously, while going full-speed ahead." When the ship went down, in April 1914, half a dozen people claimed they saw it sink. But they all reported the sighting in different locations. Jerry Eliason says he can see how that would happen. "That night in early April, there were intermittent squalls of sleet storms," he says. "So what was happening was people were seeing lights out on lake, and there were a good half-dozen ships in the process of coming and going. So they'd see a ship out there, and suddenly they wouldn't see it because the snow got in between where their vantage point was and where they were looking and the lights disappeared, so to them they were interpreting that as they all saw the Noble sink." 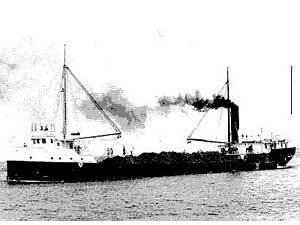 Eliason has been interested in shipwrecks for 30 years. Lately he's been hunting the ones that have never been found. Last year he and his team discovered three new wrecks. New technology helps. He uses global positioning, a camera on a long tether, and a side-scan sonar -- like an ultrasound scanner -- built by his son. In May the team invited publishers of Lake Superior Magazine out to see the wreck. Twenty years ago, the magazine offered a reward for the discovery of the Benjamin Noble. "We were really amazed at the clarity of the images, and the fact that everything we were seeing matched up with the way the Noble looked -- the number of hatches, the various ladders, the mast -- quite an amazing experience." The magazine has finally paid out on the award, and the discovery team plans to use the $1,000 to help pay for listing the Benjamin Noble on the National Register of Historic Places. The wreck belongs to the state of Minnesota, but Jerry Eliason says the state has no money for that application process. Eliason says registering the wreck will help protect it from scavengers. "I couldn't tell you how much the bell or the whistle from the Noble would be worth in some kind of illegal market, but it would have a fair amount of value," he says. "And it's always been our goal that it just be left exactly as the site is, and only be photographed." Sometime in the next couple of weeks a team member will dive to the wreck for better photographs. Meanwhile, they're still out there looking for the Robert Wallace.